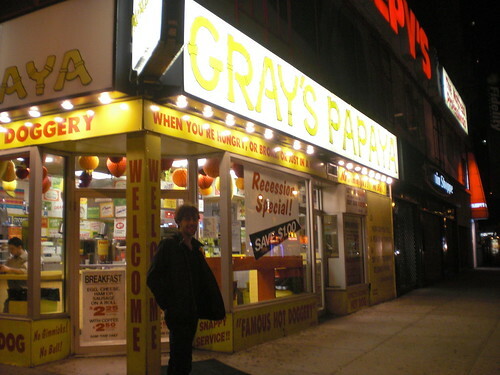 Backstory, freshman year I went to Gray's once. I walked there from 116th with someone I lived with at the time. The recession special was $2.75 and got you 2 franks with a special house drink. Fast forward to 2010, and all of a sudden, the recession special is $4. Plus tax. That's not even a special! Anyway, I couldn't not get food just because I was slightly irked at the price change, so I went with the default order, with a banana daiquiri as my drink of choice. The hot dogs themselves were okay, certainly not "the best in NYC" or whatever slogan they use. They had appropriate snap from the skin, and were just salty enough to make me glad I had a drink. The toppings of sauerkraut and onions kind of destroyed it though. Mainly the onions. The additional amount of sauce slathered over top made the thing taste more like mustard and tabasco than meat, and if I were to ever order again in the future, I would pass on the onions. Eh, what can I say, I wasn't all that impressed. 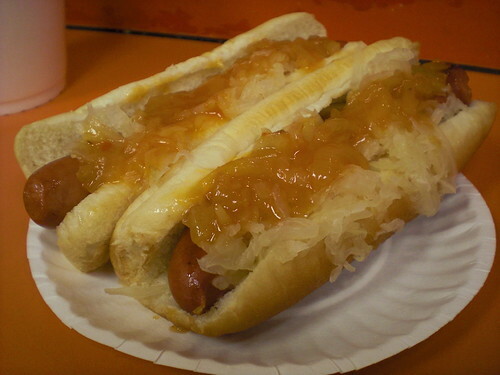 Then again I know many Papaya dog loyalists who will inevitably hate this post, I just don't see why. wow davdav is like internet famous now. BTW, love the new layout. So nice and clean. Also, love the bigger photos! @bionicgrrrl wait... did this place magically disappear? WTF if there was a hot dog place near campus i'd probably still be really fat.